Special Containment Procedures: SCP-373 is to be kept in a containment locker at Site 38. Research into SCP-373 and SCP-373-A iterations is to be carried out by authorized personnel. Grounds for immediate revocations of testing privileges include, but are not limited to: recent loss of loved ones (testing privileges suspended for five (5) years), any history of abuse or inability to follow orders as per containment procedures for other SCPs (testing privileges revoked permanently), any past association with paranormal research or investigative groups (testing privileges revoked until approval given by Site director), or any unusual or persistent interest or obsession with SCP-373 (testing privileges revoked permanently). Note from Head Researcher ████: The potential implications of this device for both SCP-373-A entities and their former loved ones require a certain degree of composure with regards to its use. Quite frankly, we may be creating these beings rather than channeling them. Personnel unable to react responsibly with that degree of power are not to be allowed access. Note from Head Researcher ████: Testing suspended until further notice. See Addendum 373-3. Testing with D-class personnel to be carried out as per Addendum 373-4. For maximum efficiency in gathering intelligence regarding SCP-373-A entities, all records used with SCP-373 should be 33 1/2 rpm vinyl albums with lyric-heavy songs or spoken-word tracks. Audiobooks, comedy albums, and other principally speech-based records are encouraged; principally instrumental or orchestral music is forbidden. 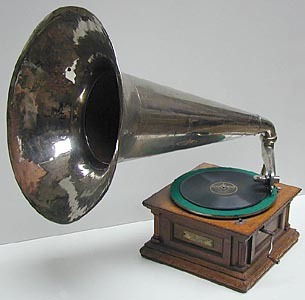 Description: SCP-373 is an antique disc phonograph player. Markings on the machine indicate it was built in 191█; an additional label indicates that the device was modified in late 194█ at a facility called "█████ Laboratories, Inc." The device is composed of a crank-operated turntable embedded in a wooden case, a tone arm with an aluminum stylus, and a slightly tarnished silver horn. SCP-373 appears to have the ability to modify the audio of any record played on it according to particular patterns. Specifically, research has demonstrated that approximately every fourth word or phrase will be altered from the originally-recorded song or monologue. These new words can be organized sequentially to reveal what appear to be messages or statements from a series of unknown entities. These entities have been named SCP-373-AX (with "X" to be replaced with a numerical identification as entities are discovered). The entity is able to communicate for the duration of each instance of the playing of the record; upon the next playing of the same record, the same entity will begin speaking, but will claim not to recall the previous conversation. Due to the stilted nature of the communication, it is rare for the entities to communicate any significant amount of information to Foundation researchers before the end of the record. However, research has demonstrated that two-way communication is possible, by lifting the needle from the record while it spins and speaking into the horn. Any attempt at useful communication requires both parties speak while the record spins at the speed at which optimal playback was intended; all SCP-373-A entities report that speaking into the horn with the record slowed or stopped results in a high-pitched squeal for the entity, and vice versa. Testing with anomalies such as SCP-043 and SCP-1668 did not initially produce data. However, analysis of audio taken during testing has shown the presence of at least two distinct breathing patterns being broadcast from SCP-373. Further scheduled testing is currently under consideration. Notes: An early attempt at scientific analysis of the phenomenon, both the choice of music and questions were largely arbitrary. Two-way communication not yet understood. Full lyrical output is included below to demonstrate effect; all future entries will include only relevant utterances. Notes: First consistent and notable demonstration of two-way communicative potential. Communication redacted to relevant utterances for convenience. Result: The following interview was carried out by Researcher Kim with Entity SCP-373-A3. Kim: (speaking as record begins, needle up) Hello. Please try to stay calm. You've had an accident and we are working to save you. Can you tell us your name? Kim: Could you please tell us your name? Kim: You're okay, Mary. Can you tell me what you see? Kim: We're very close to getting you out, just hold on tight. Can you tell me where you live and what day it is? Kim: It's fine, ma'am. Can you tell me what year it is? The record ends. Flipping the record results in the conversation beginning again, as in all other tests. Notes: Item -π-2 is a vinyl record pressed by Site 38 for testing purposes, consisting of a rapid (though clearly audible) reading of Charles Dickens's A Tale of Two Cities. The speed at which the book is read allows for approximately 720 words per minute, increasing the potential conversational ability of the ensuing SCP-373-A entity. Result: The following is the interview between Researcher Kim and SCP-373-A24. Kim: Hello. There's been an accident. We're trying to get you out, but we need you to remain calm. Can you tell us what the last thing is that you remember? Kim: I'm sorry, I can't understand you. What is the last thing you were doing? Kim: (appearing distressed) Wait, Susan? Susan? Oh, my God, Susan? Are you in here? Kim: That's her, Joey! That's my wife in there! (to SCP-373) Sweetie, it's me! Oh, God, you've been gone for almost a year, but you're back now! Kim: (knocking down Lucas, grabbing SCP-373's horn, shaking) I'm going to get you out of there! Just wait! Experiment ends. Damage to SCP-373 repaired. Researcher Lucas' injuries were treated. Researcher Kim's attack against Foundation agents attempting to restrain him led to his termination.